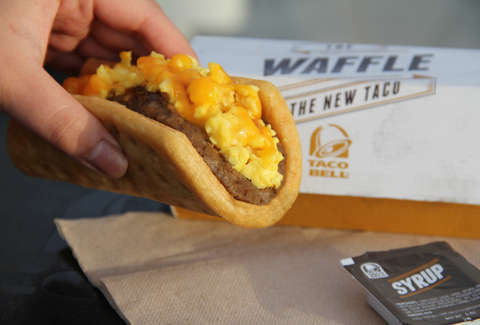 The word's been out for months about Taco Bell's Waffle Taco, but you probably haven't been able to find one in the wild -- until today. Every T-Bell across America ceremoniously rolled out the breakfast menu, which includes a plethora of new items that will both perplex and amaze you. Fortunately, we're here to cut through all the hype and get to the molten, nacho-y core of the issue. How it tastes: Holy breakfast foods, Batman! This is every breakfast-lover's dream, including everything you'd typically see at a diner, all wrapped up in one convenient tortilla package. The bacon tastes a little like fake bacon bits (the crunchiness is slightly suspicious), but otherwise the A.M. Crunchwrap is the most solidly executed new breakfast option at T-Bell. Best eaten with their new Salsa de Sol breakfast-specific hot sauce, which -- I must say -- is one of the better sauce options there. Smoky and slightly sweet. 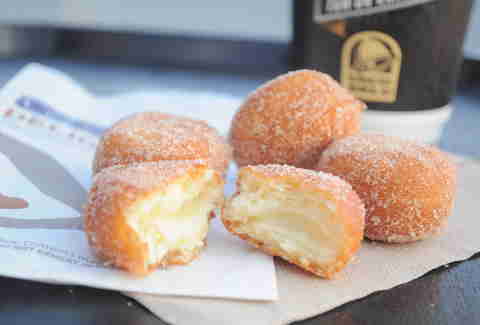 How they taste: Welp, these are some of the sweetest things that I've ever tasted in my life, and I've made pitstops at many a suburban mall Cinnabon location. I wasn't expecting them to be filled with warm icing, so imagine my surprise upon taking my inaugural bite and getting an avalanche of syrupy goo. It was delicious, yeah -- and the dusting of cinnamon sugar gave it an almost cider donut-esque flavor, at first -- but I can't imagine eating more than one of these, honestly. Bring your friends. 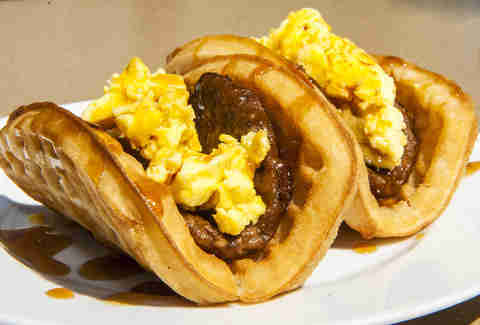 What it is: You've probably seen this one by now -- a warm waffle folded into a taco shape and filled with a sausage patty (or bacon now, apparently) and fluffy scrambled eggs. Served with pancake syrup. How it tastes: Honestly, this is probably the most underwhelming thing I tasted. The eggs and sausage aren't particularly salty, which is a rarity for any fast-food joint. It could benefit from some cheese. The pancake syrup helps the overall flavor profile, but not enough to make this thing awe-inspiring. 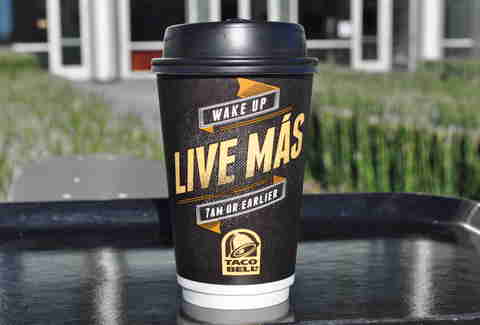 Those three items make up the signature line of T-Bell's new morning menu, but they're also offering patrons a variety of breakfast burritos and grilled tacos (think sausage and bacon), flatbread melts, hash browns, orange juice, and both hot & iced coffee. Get up early to snag this stuff at your local Taco Bell, or wait until they inevitably start bottling it and selling it in stores. 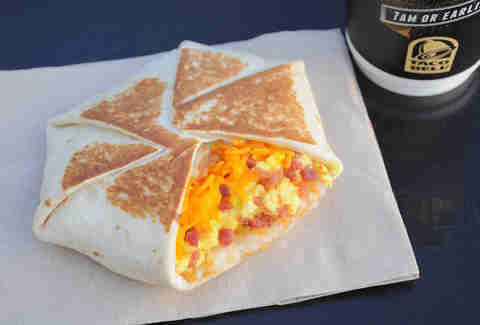 Order the A.M. Crunchwrap. The Waffle Taco may get all the glory, but the Crunchwrap is the real star of the show. Adam Lapetina is a food/drink staff writer at Thrillist, and can't wait for the unavoidable release of the Waffle Burrito. Read his musings on Twitter at @adamlapetina.